SAN DIEGO–(BUSINESS WIRE)–The beautiful beaches aren’t the only thing attracting residents to Orange County these days. With more than 1.4 million jobs identified in the area, this growing submarket has an overwhelming need for multifamily development and new living experiences. JPI, who has called Southern California home for more than 20 years, intends to meet those needs with their newest Class A multifamily development. 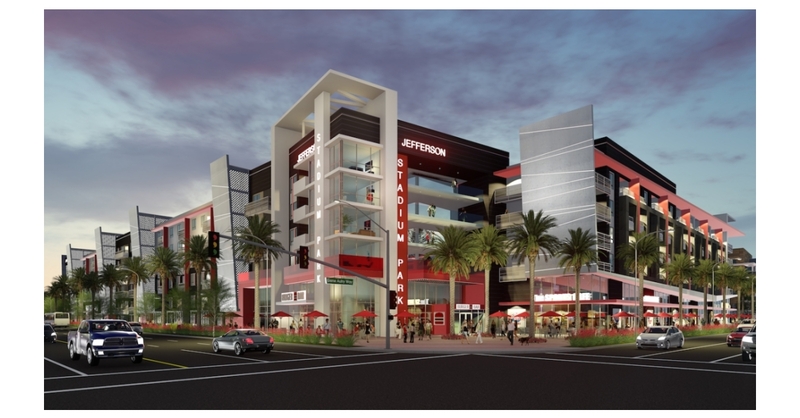 Rev at Platinum Park, which closed financing today, will begin construction in Anaheim. The financial partners for the development are MORE Residential and Bridge Bank. Rev at Platinum Park, a 332-home community located in the Platinum Triangle area of Anaheim at the intersection of East Gene Autry Way and South State College Boulevard, will include 14,600 square feet of commercial space. This will be JPI’s third community within walking distance of the Platinum Triangle. “JPI’s Rev at Platinum Park exemplifies Bridge Bank’s commitment to invest in vibrant developments in communities that are the cornerstone of economic growth. Anaheim’s Platinum Triangle, and JPI’s visionary development, is a perfect example of that commitment,” said Maggie Hsu, vice president and senior loan officer in Bridge Bank’s Construction Lending Group. Residents will enjoy being within walking distance of the 45,477-seat Angel Stadium of Anaheim, home to the Los Angeles Angels. Residents are also just minutes away from an array of nearby entertainment options including new eateries, breweries, the Packing District, Disneyland and the Honda Center concert venue, home of the Anaheim Ducks. Rev at Platinum Park, a podium-style community, was designed with a mix of modern and industrial architectural styles. The design includes an expansive courtyard with a pool and a resort-style sunken island. This project boasts a large multiuse resident clubhouse and two rooftop decks, all designed with the community experience in mind. Residents can come together and enjoy views of the ballpark and Disneyland’s nightly fireworks show. The community includes multiple barbecue areas, an outdoor lounge, and a state-of-the-art indoor fitness center with an outdoor workout space for those who enjoy the breeze. Residents will also enjoy access to the adjacent 1.09-acre dedicated public park, which includes an off-leash dog area. For residents working at top employers in the area such as Disney, UCI Medical Center, PuroClean, Volt Information Sciences and Hilton, Rev at Platinum Park is convenient to the I-5 and SR-57 freeways and the $188 million Anaheim Regional Transportation Intermodal Center. JPI is a national developer, builder and investment manager of Class A multifamily assets across the U.S. and is the most active multifamily developer in Dallas-Fort Worth. Headquartered in Irving, Texas, JPI also has offices in California, Arizona and New York. With a 30-year history of successful developments throughout major U.S. markets and an unparalleled depth of industry-specific experience, JPI stands among the most active privately held real estate companies in the country. JPI’s executive leadership team has an average of 25 years of comprehensive experience in multifamily developments – including low-density garden apartments, mid- to high-density wrap and podium projects, mixed-use developments, and student living communities. The firm offers investment management, predevelopment, underwriting, marketing and asset management services as well as construction, financial and administrative services. To learn more about JPI, please visit JPI.com. MORE Residential is a newly formed real estate company that invests in operating multifamily properties and properties in various stages of development in select markets across the U.S. Based in Plano, Texas, MORE’s executive management team averages more than 20 years of experience in multifamily investment with both public and private companies. Bridge Bank is a division of Western Alliance Bank, Member FDIC, the go-to bank for business in its growing markets. Bridge Bank was founded in 2001 in Silicon Valley to offer a better way to bank for small-market and middle-market businesses across many industries, as well as emerging technology companies and the private equity community. Geared to serving both venture-backed and non-venture-backed companies, Bridge Bank offers a broad scope of financial solutions including growth capital, equipment and working capital credit facilities, sustainable energy project finance, venture debt, treasury management, asset-based lending, SBA and commercial real estate loans, ESOP finance, and a full line of international products and services. Based in San Jose, Bridge Bank has eight offices in major markets across the country along with Western Alliance Bank’s powerful array of specialized financial services. Western Alliance Bank is the primary subsidiary of Phoenix-based Western Alliance Bancorporation. One of the country’s top-performing banking companies, Western Alliance ranks second on the Forbes 2018 “Best Banks in America” list. For more information, visit bridgebank.com.